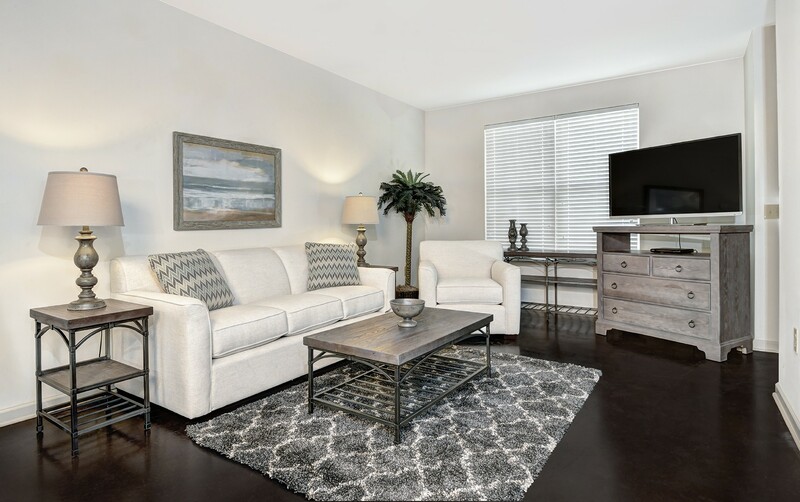 Providing a properly furnished model at your community will afford prospective renters the occasion to visualize themselves living in that apartment home – facilitating your goal: Leasing Apartments! Furnish the model just enough to give the impression of ‘home’ while still leaving ample room for individual interpretation. Inspire, don’t distract! Avoid personalized decorative themes, pictures of people, family items, and gender-specific décor so that the prospective renter wills envision the model as his/her home and not someone else’s. Keep entrance ways, halls, and thoroughfares open and easily accessible so that the future resident (and the leasing consultant) can easily move about. A critical element of successful staging is to emphasize spaciousness. Choose smaller scale furniture that will show livability without becoming a distraction and making the accommodations appear cramped. For smaller living rooms, use a chair side table with a lamp on one side of the sofa and a slim-line floor lamp on the other. Using counter-height stools or a small pub table set can be an effective option when dining room space is limited. Placing mirrors on walls opposite windows will reflect more natural light and make rooms seem more expansive. Sparsely furnish the bedroom (most can easily visualize their own beds) and keep closets completely empty. Always avoid dark colors, heavy rugs & curtains, floral patterns, and clutter.